Have questions? Please give our knowledgeable staff a call at (800) 347-8554. Save even more off of our already low prices when you purchase the AmeriGlide Platinum Curved Approved Used Stair Lift. This unbeatable value will allow you to enjoy the reliable performance, for a discounted price. We are so confident in the quality of our products and the thoroughness of our reconditioning process, that we are proud to offer the nation’s best warranty. Want to improve your safety and mobility and live a more independent lifestyle? 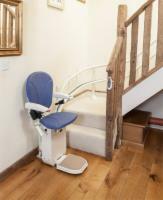 Call us today to speak with an expert and begin your stair lift installation project!